This blog form Heather Hurst, Corporate Marketing Director at Workfront recently appeared on the WorkFront Work & Project Management Blog, and we think our readers will find it useful. To keep up with the competition, business leaders are pushed more than ever to create diverse, skilled, and large teams. But, without an eye toward collaboration, the very things that make this type of team the best qualified to tackle some of your organization's biggest challenges can cause your teamwork, trust, and productivity to fall apart at the seams. "Members of complex teams are less likely—absent other influences—to share knowledge freely, to learn from one another, to shift workloads flexibly to break up unexpected bottlenecks, to help one another complete jobs and meet deadlines, and to share resources—in other words, to collaborate." Individual team members become guarded of their own job roles and expertise in order to protect their own job security and focus on their own career development. However, taking the time to overcome the challenges that come with complex, skilled teams and carefully guiding team members to take a more collaborative approach pays off. 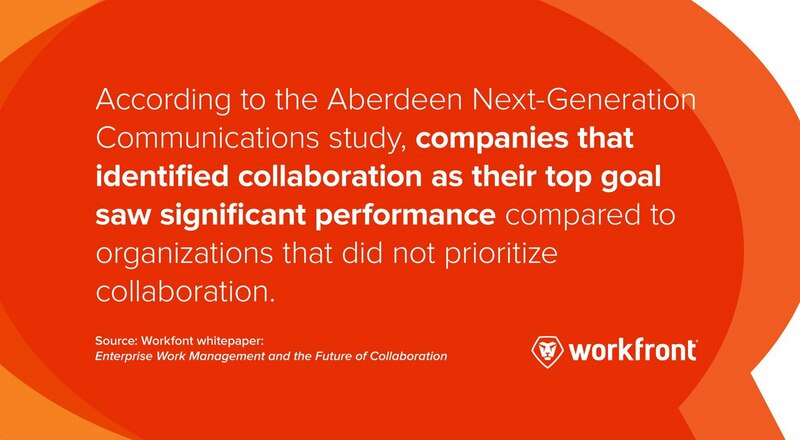 An Aberdeen Next-Generation Communications study showed companies that identified business collaboration as a top business goal also saw an increase in business performance, compared to the companies that did not prioritize collaboration. 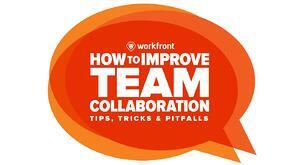 Effective collaboration affects the bottom line. It helps your team move more smoothly and seamlessly through processes and projects, shortens work cycles, keeps everyone informed and in the loop, and gives everyone more time to produce great work. Let’s get this out in the open—emails and spreadsheets are not collaborative tools. Emails can be effective in communicating with an individual, but not when a conversation or project involves multiple people. Spreadsheets are static. Most teams who use a combination of email and spreadsheets end up sending different versions back and forth creating chaos, confusion, and extra work. 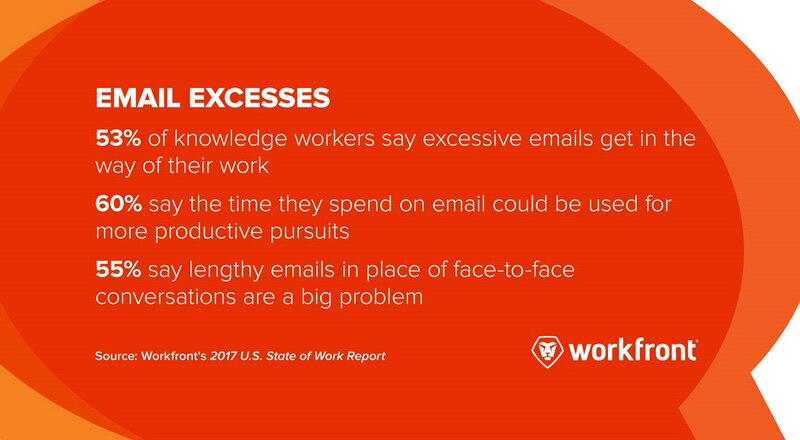 In fact, our recent State of Work Report found that three in five workers (60%) say the time they have to spend dealing with email is time they could be more productive. And, over a quarter (28%) of workers aren’t using a robust project management tool, but would like to use one. Choose the right tool for the job—a platform designed for work management and collaboration. Do your research to determine the best tool for your team, and then stick to it. Don’t embrace every tool that exists—choose one. Then, make sure everyone is on board with using the tool. If only half of the team uses it, it won’t be as effective. Make sure team members understand both the overall goals and their specific roles to achieve them. First, help teams understand the big picture, including the why behind the work. This will motivate and guide individuals to work together to achieve an end goal. Once you lay out the big picture, you can’t just let teams figure out how to get there on their own, however. Research shows collaboration improves when team members have clearly defined and well-understood roles. This is the second part—individuals need to understand their specific roles in the big picture. They need to feel both accountable and empowered to complete their tasks independently. This is especially crucial for highly skilled team members. Allow your experts to work on their own assignments, but also bring them out of their silos to see how their individual work has contributed to the larger goal. For instance, once an ad campaign has launched and starts producing results, circle back with team members to show how it’s performing. Give praise to both individuals and to the entire team. 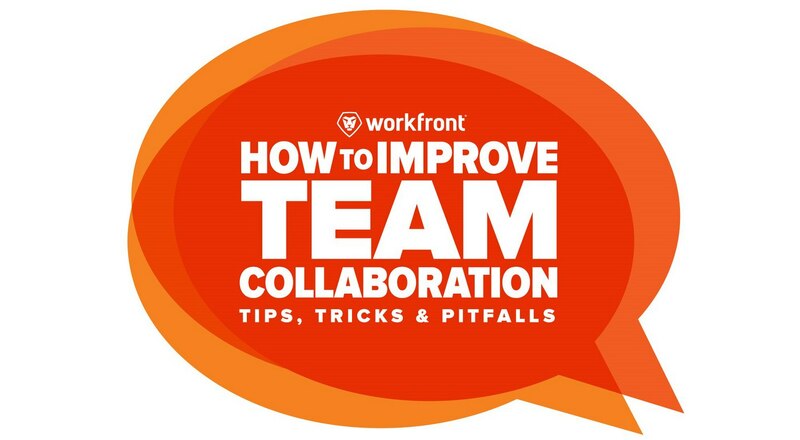 We’ve talked previously about the importance of praise with these 40 tips to get your team collaborating like pros. Sharing a few kind words—which can be easily added as comments on a platform—is a simple gesture that can make anyone feel more valued. Make your praise specific and targeted toward individual team members and the entire group. Identifying specific ways team members have gone above and beyond sends a strong signal to other team members that their leaders value individual contribution—especially when it drives group success. According to a study by Globoforce, 55% of employees who were recognized within the last month felt confident about change, and 14% were excited about change. Since shifting teams, objectives, and markets can make everyone feel nervous, it’s clear that praise helps boost confidence and reaffirms people’s desire to be part of a team that they can count on. With the use of online platforms to collaborate, teams may not always be chatting near the coffee machine, but that doesn’t mean relationships have to suffer. A collaborative team thrives on relationships based on an environment of trust. Carol Kinsey Goman, a collaboration expert and Forbes contributor, explained that leaders build trust by displaying trustworthiness. As managers and team leaders choose to be “consistent, candid, open, vulnerable, and supportive,” they act in a way that builds trust with team members. Consistency and reliability build trust. Clearly communicating tasks and deadlines increases both trust and collaboration. In work environments, people often assume different paths to getting work done. Some employees may have no idea what others are doing—as they focus on their specific tasks with blinders up to everything else. Bringing everyone into the conversation doesn’t need to require a lot of extra work. It can be as simple as uploading project information to the cloud or into a shared document, identifying key stakeholders early in the project process and communicating clearly and often with them, and setting clear deadlines and making sure task hand offs are smooth. By sharing information, teams can benefit from work that has already been done—avoiding wasted time and money. Breaking down silos through more open communication, systems, and tools, prepares the way for collaboration. Email: Email is not a collaboration tool. Think before you send an email to make sure it is the best form of communication for the task at hand. For example, if more than one person is involved in the conversation or if feedback is required, move it to another platform. Status Meetings: Meetings can be effective tools to kick off a project or review results, but recurring weekly or monthly meetings do not lead to actual collaboration, just the appearance of collaboration. Almost half of all workers identify unfocused meetings as their biggest time-waster. Don’t feed the status meeting—starve it—and you’ll find yourself with more time for real collaboration. Face-to-Face Updates: Similar to meetings, frequent in-person check-ins waste time. Technology such as Slack, IM tools, and project management software provides a more efficient way to find out where things stand. Meeting with individuals for “a minute” turns into hundreds of wasted minutes over a few days. Save face-to-face interactions for work that requires creativity and brainstorming, not for unnecessary updates. Letting conflict fester: A toxic work environment pushes your best talent out. According to a study by Cornerstone OnDemand with Northwestern University, employees are 54% more likely to quit if they have a “toxic” employee on their team. Address conflicts with personality, deadlines, or expectations early. The longer they sit, the more intense and explosive the fallout will be, and those bad feelings will linger and seep into the entire team’s productivity. Putting Technology Over People: In the process of adopting more efficient systems and technology to get the job done, don’t forget the heart of it all—the people. People thrive on connection and relationships. Before throwing a team together to get a job done, let them get to know one another. As they discover each other’s strengths and weaknesses, they will build trust—a foundation for collaboration. Collaboration is the key tool your talented, driven, and expert team needs to meet and exceed objectives. A talented group of people isn’t successful on their own. Innovative leaders must intentionally focus on collaboration through technology and tools, praise, transparency, and defined roles and structures. And as a result, your team will be more connected to their work, coworkers, and organization. To learn more about how digital asset management can help improve your teams collaboration and efficiency download our free guide: Future-Proofing Your Digital Asset Management and Creative Production.